As most of you guys are already aware, Mid-Autumn festival is just around the corner. And you know what that means, right? Mooncake! I personally don't fancy the traditional mooncake as much, but when it comes to a reinterpretation of the classic, I'm all in. Things like ice cream mooncake or even, the ever so popular Snow Skin Mooncake, are some of what I love to have. 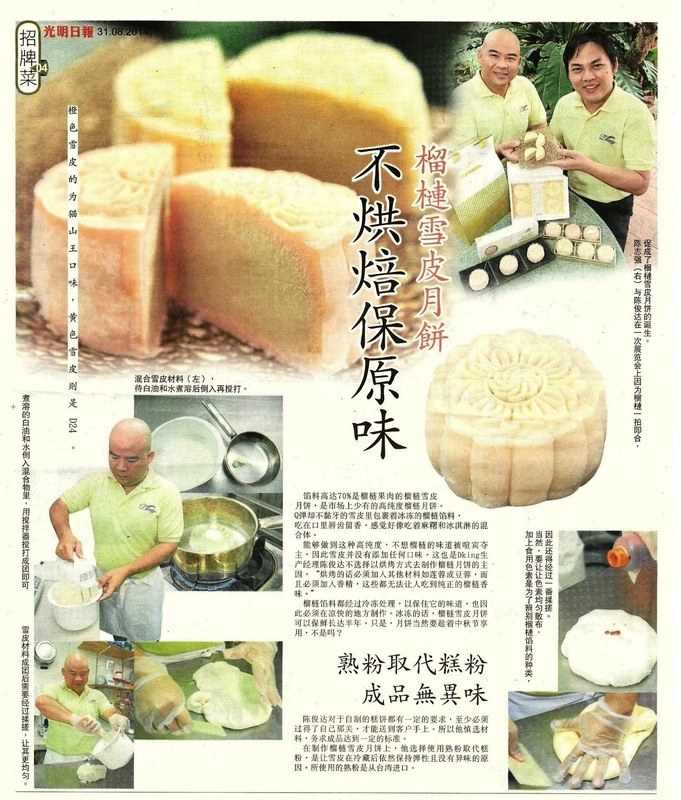 D'King Premium Vegetarian Snow Skin Musang King Mooncake is no exception. And in this particular blog post, all eyes will be on the king of fruits, the Durian (mooncake). 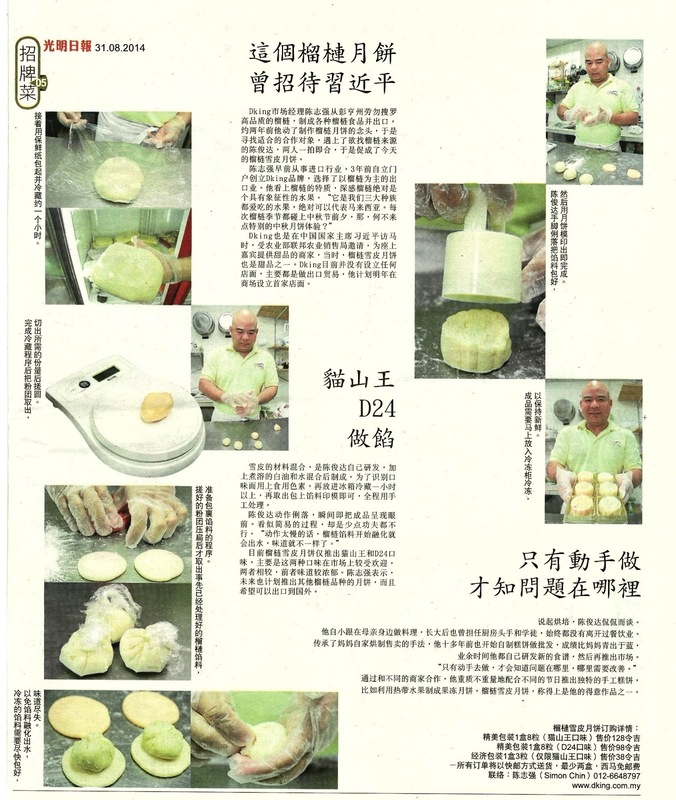 What I loved about D'King's Musang King Mooncake is the simplicity of idea behind the mooncake. Just durian flesh and a beautiful, soft and bouncy skin. Unlike most mooncakes that come in the size of the moon, D'King's version is significantly smaller. This personally, helps reduce unwanted wastage that happens every year during the Mid-Autumn festival. Some of you may know or even experience this first hand, that only a portion of a mooncake is eaten while the rest is left in the fridge or thrown away. However, do not be fooled by it's size. Despite being at least 40% smaller, D'King's Musang King mooncake packs a punch in flavour and texture. The all natural, preservative-free, no artificial flavouring and high-grade Musang King from Pahang really got me hooked on for more. One bite was simply not enough. The mooncake was not only soft and bouncy, but sticky and gooey as well. The snow skin texture was executed perfectly, where the balance of lightness, stickiness and density really works. In short, it's light, aromatic and absolutely flavourful. It's as if I was taking a bite out of a real Musang King. It came in a box, together with a thermafreeze ice pack that is used to keep the mooncake cold and fresh. The duration in which the thermafreeze can continuously keep the mooncake cool is roughly 12 hours, which allows you to bring it halfway around the world without worrying. For those worried about the pungent smell of durian, do not worry. As each mooncake in individually sealed, not even the slightest whiff of heaven is noticeable. Hence allowing trouble-free check-in anywhere. For those who are interested in ordering a set of these lovely mooncakes, here's the details you'll need to know. Each set contains two boxes, in which each boxes has 4 (60g) mooncakes in them. Hence, a total of 8 (60g) mooncakes per set. The usual price for 1 set is RM128, but the ongoing promotion will set the price at only RM98 per set! That's a solid RM30 off. Delivery is free when two or more sets are purchased. * Please call for special price for bulk purchase (corporate gifts, above 10 sets).